This Saturday afternoon I am attending a culinary, styling and food photography workshop with a leading celebrity chef and executive chef of one of the most premier restaurants in Bangalore. After that I am promised a sumptuous lunch with blogger friends. Am I excited? Off course yes. 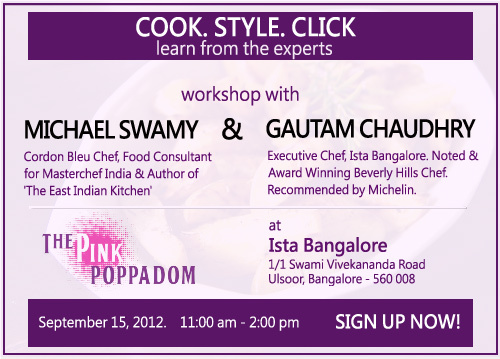 As promised earlier to their bloggers, BlogAdda is finally presenting latest food workshop with Pink Poppadom, Bangalore – led by celebrity chef Michael Swamy and executive chef, Gautam Chaudhry, Pink Poppadom. Like every bloggers events, this comes with gift hampers, gifts, goodies and some tease. As a bonus Blogadda is offering the first 15 bloggers who sign up two buffet passes worth Rs 1600, from Barbeque Nation along with a gift hamper from Ista Bangalore. A video of previous workshop conducted by Blogadda. Woohooo....sounds like so much fun! I can't Farida! Weekends are as it is busy with kids' exams coming up, add to it hubby is traveling. You enjoy and will look forward to your post on it. That's great, I would have loved to attend. sounds fun...wish i could attend too.